Our final four #BBNaija 2018 housemates Anto, Tobi, Cee-C and Lolu have made their way into Biggie's house..Meet our final four #BBNaija 2018 housemates Anto, Tobi, Cee-C and Lolu, they're on stage with Ebuka..
please show them some love by SHARING this POST. Our next four #BBNaija 2018 housemates Ifu, Leo, Khloe and Angel have now entered the house. Show some love to our next four #BBNaija2018 housemates Ifu, Leo, Khloe and Angel. 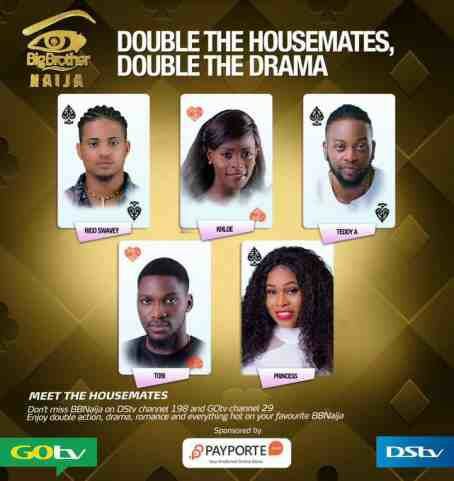 They're on stage with Ebuka Our next four #BBNaija housemates Ahneeka, Rico Swavey, BamBam and Bitto have entered the house..Our next four #BBNaija housemates Ahneeka, Rico Swavey, BamBam and Bitto are on stage with Ebuka..
Our next four #BBNaija housemates Princess, Alex, Dee-One and Miracle have left the live stage to enter the house...So ladies are you already in love with the Hot dude Miracle?? #BBNaijaOur next four #BBNaija housemates Princess, Alex, Dee-One and Miracle are now on stage with Ebuka..